Did gold come from black holes? 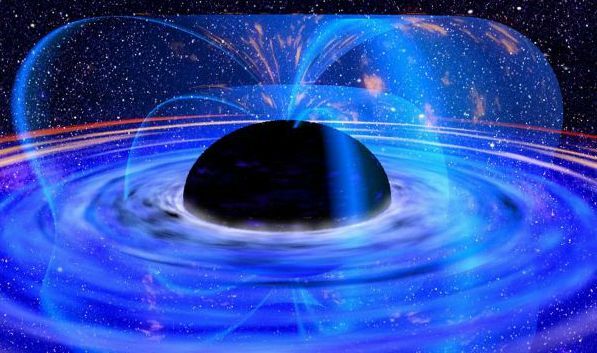 Black holes are areas of spacetime with gravity so intense that nothing can escape. There’s a huge one at the centre of the Milky Way, and more speckled throughout the galaxy marking the remains of massive exploded stars. But physicists aren’t sure when the first ones appeared. Primordial black holes are supposed to have been created shortly after the Big Bang when matter was so close together that pockets clumped and collapsed. They’ve never been found, but physicists at UCLA think that they might have been responsible for creating heavy elements like platinum, uranium and gold. Scientists know that these heavy elements exist, but they’re not sure where these elements are being formed... This has been really embarrassing. They reckon that if a neutron star collided with a primordial black hole, the hole would gradually consume it, shrinking the star and making it spin faster. As the star span, fragments would fly out, fusing to become heavy elements. The whole process would take around 10,000 years. It's early days, but this could finally explain where our precious metals come from. The next step is to team up with Princeton scientists to test the idea using models. Our comfortable modern lives have removed a lot of the selective pressures that pushed our species to evolve, but researchers at Columbia University think the gene pool is still being edited. They scanned two huge genome databases, trawling through the genetic code of 210,000 people from the US and the UK, looking for genes linked with age-related survival. We all carry different variants - or alleles - of the same genes, some of which could give us an ageing advantage or cut our lives short. The team wanted to see whether the number of people with specific variants changed with age. Two of the genes they looked at were APOE, which is linked with Alzheimer’s disease, and CHRNA3, linked with a tendency to smoke. They found that women over 70 were less likely to carry the Alzheimer's-linked APOE variant, and men past middle age were less likely to have the smoking-linked CHRNA3. Variants linked with asthma, obesity and heart disease also dropped in people who lived longer. It looks like we're not done evolving yet. Unhelpful genetic variants are still being weeded out, and we'll likely continue to change as tech advances and medicine improves. Could genetic code form on Mars? Late last year, Curiosity's ChemCam detected boron in Gale Crater and, in a paper published this week, scientists have been getting excited about what that means for life on the red planet. Boron is a chemical element that forms water-soluble borate minerals, and these could help to stabilise critical molecules needed to build genetic code. Gale crater used to contain a lake and evidence that it could once have been habitable is mounting, but life needs complex molecules to carry instructions from one generation to the next. On Earth, this comes in the form of DNA and RNA (ribonucleic acid). RNA probably came before DNA in our evolutionary history, assembling into self-replicating strings of code that became the first life prototypes on Earth. But, the subunits of the molecule are made an unstable sugar, ribose, which quickly breaks down. Curiosity's ChemCam has been shooting laser pulses at Martian rocks, exciting their electrons and causing them to spit flashes of light. Different chemicals produce different light signatures, from which an on-board spectrometer can ID the atoms. In the depths of Gale Crater, it picked up borates, which can stabilise ribose sugars. Under the right conditions, this could have allowed strings of RNA to form on the red planet, giving the Martian environment the chance to make proto-organisms of its own. Curiosity isn't properly equipped to search for life but Mars 2020 will be carrying the upgraded SuperCam, along with an arsenal of other life-scoping tools to find out if our dusty neighbour was ever inhabited by aliens.